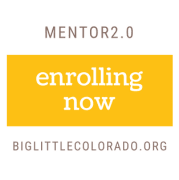 MENTOR2.0 RECRUITING FOR INCOMING FRESHMAN CLASS Big Brothers Big Sisters of Colorado- Pikes Peak is looking for mentors! Mentor2.0 is a high school based mentorship program focused on goal setting and academic success. This 2018-19 school year is the 3 rd year of our partnership with Atlas Preparatory High School where BBBS matches every freshman with a mentor from the community. This mentoring opportunity is flexible and ideal for busy professionals. If you are interested in making a lasting impact on the life and future of a local teen in the Colorado Springs community, please reach out to us through this posting!